1st My 1st 4WD. I called it the "Sharman Tank" as it was unstoppable! But after a few years, it started burning a lot of oil and rusting quite badly, so it was time to update! 2nd My 2nd 4WD was bought brand new. How nice to drive a new more modern 4WD! 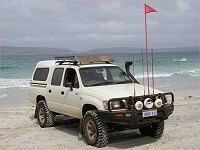 3rd My cruiser was my best 4WD, being most reliable, and most capable off road. I regret selling it. Purchased 2nd hand at age 1.5 years and 40000k on the clock. Hilux Project and Rodeo Project. 4th I decided on Rodeo Project, and forged ahead doing up my little truck. Purchased 2nd hand at age 1.5 years and 30000k on the clock. 5th I decided next to get a Toyota Hilux ( Hilux Project ), bought a brand new one in. 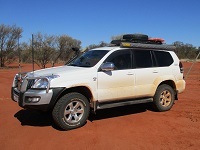 This was my best 4WD to date, after never having a serious mechanical problem in 7 years and 230000 k's. What a great 4WD! 6th Ok, so time for more comfort. I am thinking coil springs, Auto transmission, good fuel economy. So I decided on a Kia Sorento. Read how I decided on my Sorento Project page. I bought this brand new. 7th Ok, so, the Kia turned out to be too troublesome (read about the troubles here). And my new partner already has a Pajero which is in good condition and well setup, so, it makes sense that this should be my main 4WD, and the Sorento should be stripped back and sold. 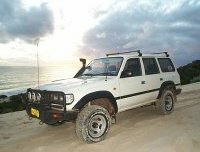 8th Finally, I was able to purchase a 4WD that best suited my needs, being Toyota reliability, decent power and economy from the D4D diesel engine, and great touring range from dual 90 litre fuel tanks. Contact Skip (Alan - that's me) for more info. Email me.  These pages were last updated on 25 Aug 2013.